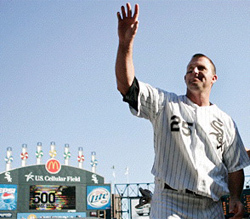 After heading west to The Dodgers for the final part of the 2009 season, Jim Thome would like to return the Chicago White Sox, the team where he found a comfortable and productive home for 3½ seasons. "Everyone knows how I feel. I love Chicago,” Thome said recently. “Ultimately, if things work out, I would love to come back. It's a great city. It's home. It has been a great place. Jerry, Ozzie, the whole organization, they have all treated me great." So what about a return to Chicago in 2010? Thome, who recently showed up at a charity event for Children's Memorial Hospital in downtown simply smiled and thanked the fans, primarily offering up a 'We'll see' in response. "Obviously, it's real early in the stage of all this," Jim said during his brief talk with the media. "It's new for me. I haven't been through many of them (contract negotiations). We will see what happens as we go on." Playing in Chicago also would seem to be a natural fit, with the White Sox looking for another left-handed bat for their lineup. And the loyal fans aren't the only ones who hope for Thome's return. Williams hasn't ruled out a Thome return but certainly made it seem as a topic to be broached a little later, rather than sooner, during the Hot Stove period. As far as having a gut feeling in predicting a White Sox return, Thome espoused his version of the wait-and-see approach. Since he started hitting at DH for Chicago’s southsiders in 2006 Thome averaged over 30 homers per season over the past four years, including his landmark 500th home run on September 16th, 2007. According to White Sox GM Kenny Williams, Chicago is definitely considering inviting Big Jim for a curtain call season. "Everyone knows I have the utmost respect for Jim Thome, the man and the player. He's got to see what's available, and we have to see who we are and what type of team we want to field."